Dr. Mark E. Peterson lectured to a packed crowd of over 80 veterinarians from the tri-state area on Sunday, March 18th at the second Animal Endocrine Seminar. 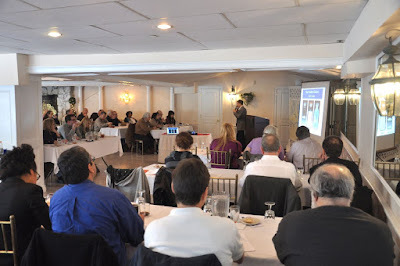 The seminar was held at Antun's in Elmsford, NY and was open to members of the veterinary community. Treatment of Cushing's Syndrome: Vetoryl or Lysodren? Overwhelmingly positive feedback from the vets attending Dr. Peterson's seminars has led him to begin scheduling these events regularly. To keep informed about upcoming seminars, please sign up for the Animal Endocrine Newsletter by clicking here. To see all the images online, click here.